Halloween doesn't have to be all thrills and chills. Help your child make a yummy and inexpensive treat for her friends and family members. Watch out though! Some of these ghosts have a silly secret under their ghostly cloaks. Have your child layer two white tissues on top of each other. Help her shift the top tissue so that the corners are not exactly lined up with the tissue below it. Let her place the top of the lollipop in the centre of the tissues. Help her gather the edges of the tissue upward, fully surrounding the lollipop. Have your child hold the tissues securely at the base of the lollipop. Use orange yarn to tie a small bow around the base of the lollipop. Help your child use a black marker to draw a face on the tissue paper. She can make a scary ghost with an open mouth (imagine the ghost shouting "Boo!") or a friendly ghost with a simple smile. How many of your child's friends and family members would appreciate a tasty snack? Help her make enough lollipop ghosts for all the special people in her life. Encourage her to try and make different faces for each ghost. 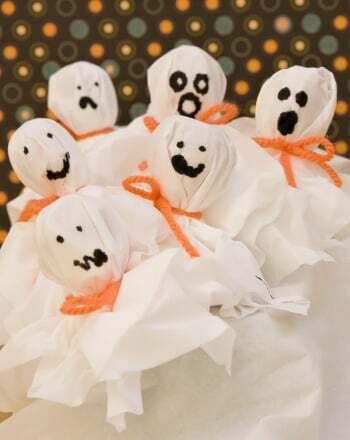 While your child is busy drawing faces, add a bit of spooky fun by creating some "ghostly" lollipops. Mold a small square of tin foil over one of the lollipops. Remove the lollipop carefully, allowing the tin foil to retain the spherical shape. Cover the tin foil with tissue -- just like you would do with the normal lollipop -- and secure with orange yarn. Gently draw a face on the tissue. Combine your child's lollipop ghosts with your fake lollipops. Trick or treat! Will people get a real lollipop or just the ghostly remains of one? 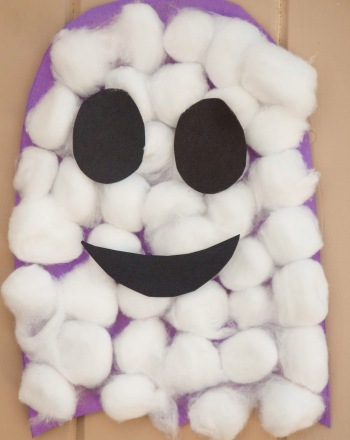 Make sure you and your child make enough actual lollipop ghosts so that everyone can enjoy -- even if they picked a tin foil one on the first try. Get silly with this Hidden Ghosts game! Kids will hunt for the hidden ghosts, and then write out a sentence to tell where they found their ghost. 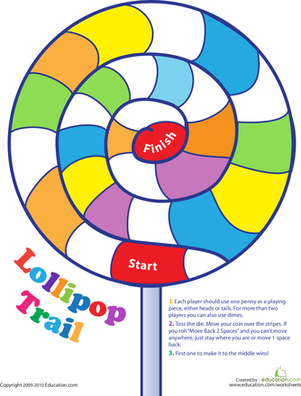 Lollipop Trail is a fun printable board game that will entertain your kindergartener and help him practise counting, too! Though these scary Halloween ghosts may give you a fright, they're actually quite friendly and want some colors. Can your child help? Bust out the candy and the spooky ghosts! Can your kindergartener match each Halloween word to the correct picture? She'll write out spooky and silly items like candy, ghosts and spiders. Prepare her for Halloween's big night with a simple crossword puzzle full of candy, ghosts, pumpkins and more! These number ghosts are having a Halloween party, but before it starts they need all of their digits. Your child can help by completing the numbers. Play this pumpkin game with your little ghosts and ghouls. Play Halloween tic-tac-toe with ghosts and bats in this board game version of the classic game. Go for three in a row with this Halloween tic-tac-toe game.